I hope everyone had an awesome Christmas. 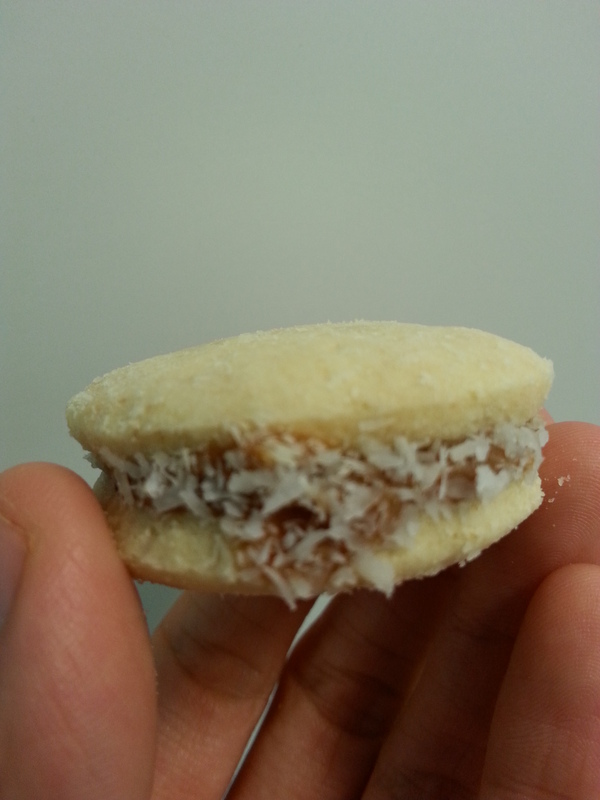 Something that I thought would taste fantastic for this time of the year (make that any time), is the alfajor (or alfajores pl). Though originally from Spain, it spread where the Spanish went to places like the Philippines and, of course, Latin America. The one from Spain sounds a bit like the Middle Eastern baklawa (I’d love to hear feedback on it) based on its ingredients, which is understandable due to the Arab influence from when they ruled the region. I am personally more familiar with the Argentianian variety made with dolce de leche with the two cookie pieces. Sometimes there are variations with jam or mousse. I still prefer the dolce de leche. In any case, I leave you with an image with the mini version with coconut flakes that I got to taste during my travels. It is as yummy as it looks.